New set of archival edits from the deceased master. The a-side takes Blue Magic's sweet tale of lost love and turns it into an absolute disco stomper. 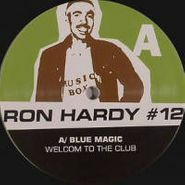 Hardy uses the wild vamping of the original's outro as the heart of the track, setting controls for euphoria. The b-side is comprised of two awesome early house rhythms.